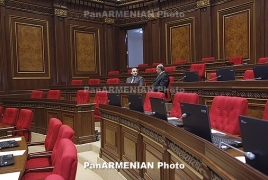 PanARMENIAN.Net - The last Saturday of April will be marked as Citizen’s Day in Armenia, according to a bill approved by the National Assembly in its second and lat reading on Tuesday, April 9. With 97 votes in favor and three against the initiative, six abstentions, lawmakers voted to designate a special date to celebrate Citizen’s Day following the massive disobedience campaign and the velvet revolution of April-May 2018. On April 23, 2018, Armenia’s third President, then Prime Minister Serzh Sargsyan resigned which led to massive celebrations across the country. On May 8, 2018, opposition leader Nikol Pashinyan was elected the country’s new PM, which too led to celebrations.